Not to be confused with Interment or Internship. This article is about the usage and history of the terms concentration camp, internment camp and internment. For a listing of individual camps, see List of concentration and internment camps. For The Walking Dead episode, see Internment (The Walking Dead). Internment camp for Japanese Canadians in British Columbia during World War II. Internment is the imprisonment or confinement of people, commonly in large groups, without trial. The Oxford English Dictionary (1989) gives the meaning as: "The action of 'interning'; confinement within the limits of a country or place." Internment also refers to the practice of neutral countries in time of war in detaining belligerent armed forces and equipment in their territories under the Second Hague Convention. Early civilizations such as Assyria used forced resettlement of populations as a means of controlling territory, but it was not until much later in the late 19th and 20th centuries that records exist of groups of civilian non-combatants being concentrated into large prison camps. As a result of the mistreatment of civilians interned during World War II, the Fourth Geneva Convention was established in 1949 to provide for the protection of civilians during times of war "in the hands" of the enemy and under any occupation by a foreign power. It was ratified by 194 nations. Prisoner-of-war camps are internment camps intended specifically for holding members of enemy armed forces as defined in the Third Geneva Convention, and condition of their treatment is specified in that Convention. Bedouins at the Italian El Agheila concentration camp during the Pacification of Libya. Photo taken between 1930-1933. The Random House Dictionary defines the term "concentration camp" as: "a guarded compound for the detention or imprisonment of aliens, members of ethnic minorities, political opponents, etc. ", whilst the American Heritage Dictionary defines it as: "A camp where civilians, enemy aliens, political prisoners, and sometimes prisoners of war are detained and confined, typically under harsh conditions." The Polish historian Władysław Konopczyński has suggested the first concentration camps were created in Poland in the 18th century, during the Bar Confederation rebellion, when the Russian Empire established three concentration camps for Polish rebel captives awaiting deportation to Siberia. The earliest of these camps may have been those set up in the United States for Cherokee and other Native Americans in the 1830s;[attribution needed] however, the term originated in the reconcentrados (reconcentration camps) set up by the Spanish military in Cuba during the Ten Years' War (1868–1878) and by the United States during the Philippine–American War (1899–1902). The English term "concentration camp" was used more widely during the Second Boer War (1899–1902), when the British operated such camps in South Africa for interning Boers. They built a total of 45 tented camps for Boer internees and 64 for black Africans. Of the 28,000 Boer men captured as prisoners of war, the British sent 25,630 overseas. 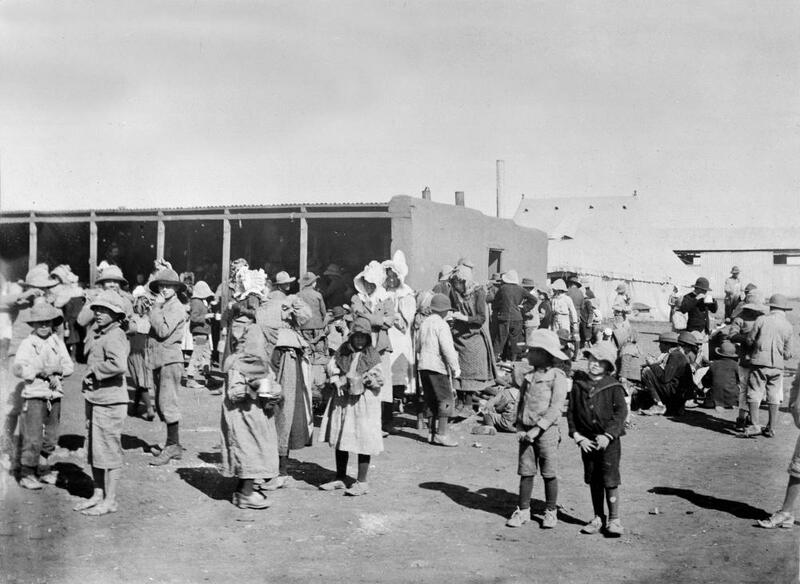 The vast majority of Boers remaining in the local camps were women and children. Between 1904 and 1908, the Imperial German Army operated both concentration camps and the Shark Island Extermination Camp in German South-West Africa (now Namibia) as part of their genocide of the Herero and Namaqua peoples. Jewish slave laborers in the Buchenwald concentration camp near Jena, 16 April 1945. Second row, seventh from left is Elie Wiesel. During the 20th century, the arbitrary internment of civilians by the state reached a climax with Nazi concentration camps (1933–1945). As a result, the term "concentration camp" today carries many of the connotations of "extermination camp" (or "death camp"), and is sometimes used synonymously with these terms by people who are unaware of the original usage pre-1933. Not all Nazi concentration camps were "extermination camps" however. Many were used primarily to house forced labor. The inmates in these camps were held there for the purpose of exploitation, rather than extermination. However, for the many inmates of these "Arbeitslager" or "Forced Labor Camps", the result was often the same as many did not survive them, dying from malnutrition, disease or simply as a result of the inhuman conditions under which they were kept; effectively extermination through labor. ↑ "The Second Hague Convention, 1907". Yale.edu. http://www.yale.edu/lawweb/avalon/lawofwar/hague05.htm. Retrieved 1 February 2013. ↑ "Laws of Hammurabi". Eawc.evansville.edu. http://eawc.evansville.edu/anthology/hammurabi.htm. Retrieved 1 February 2013. ↑ "Full text of 4th Geneva Convention". Icrc.org. http://www.icrc.org/ihl.nsf/FULL/380?OpenDocument. Retrieved 1 February 2013. ↑ Konopczyński, Władysław. (1991) Konfederacja barska, t. II, pp. 733–734. ↑ 7.0 7.1 "Concentration Camp". Concentration Camp (Sixth Edition ed.). Columbia University Press. 2008. ↑ "Documents re camps in Boer War". sul.stanford.edu. http://www-sul.stanford.edu/africa/boers.html.